Manual wet salt mill in wood and acrylic, natural 14 cm - 5,5in. 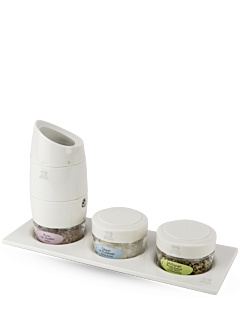 Manual wet salt mill in acrylic, white 14 cm - 5,5in. Manual wet salt mill in acrylic 14 cm - 5,5in. Manual salt mill in wood and acrylic, chocolate 14 cm - 5,5in. Manual salt mill in stainless steel and acrylic 14 cm - 5,5in. 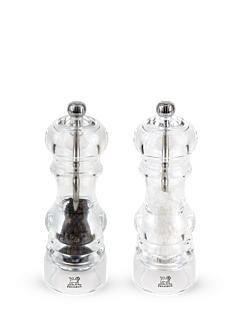 Bright and completely transparent, the Peugeot acrylic salt mill is incomparably elegant. With the visual effect of the acrylic, the white, pink or even blue salt crystals appear as if suspended. A genuine pleasure for your eyes and for your taste buds.